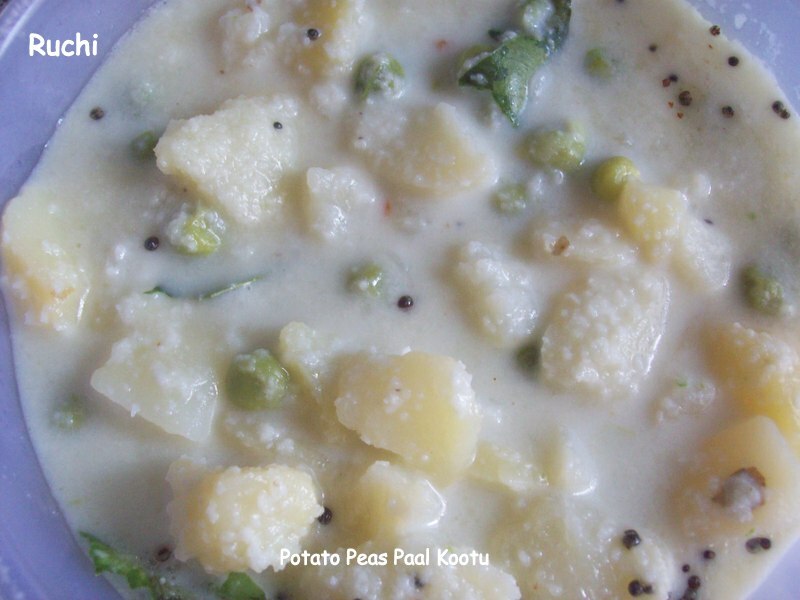 This Paal kootu is a very simple , delicious authentic side dish .You can make this dish with any vegetables. But My family loves potato and green peas in coconut milk It has mild sweetness. This recipe is my Mothers special I learn it from her. this Paal kootu is my family's favorite dish! 1. Wash the potato well and peel the skin off. 2. Then cut the potatoes into cubes and cook them well. But don’t mash them. 3. Boil the green peas until peas get cooked. 4.Blend the coconut, green chillies and the soaked rice to a fine paste. 5.Add the ground mixture and salt to the cooked potatoes and peas. 6. Mix them well and Allow to cook up to 5 mins . 7.Heat oil in a pan, add mustard seed, urad dhal,curry leaves &,When they crackle, add to the kootu. 8.Finally add milk /coconut milk and serve with Rice accompanied by sambhar or Rasam. A very delicious kootu!! Going to try this out soon!! I want to make this kootu since a long Akka, dunno y am yet to try it..Kootu looks delicious.